U19 Championship. 2nd round. August 13, 2016. Kyiv. Valeriy Lobanovskyi Dynamo Stadium. 16 degrees. The Pitmen's coach Serhiy Popov used virtually the same line-up as in the previous winning game against Stal with one exception - in the game with Dynamo he fielded Volodymyr Yakimets instead of Murad Khachaev. The teams started the game on a collision course. The Donetsk team created sharpness thanks to the rapid crosses by Maksym Andrushchenko, but with time the Kyiv team seized the initiative. On 10 minutes, the White-and-Blues were awarded a free-kick 23 meters away from the goal on the right flank. Bohdan Ledniov curved the ball around the wall, sending it into the near corner of the Pitmen's goal - 1-0. 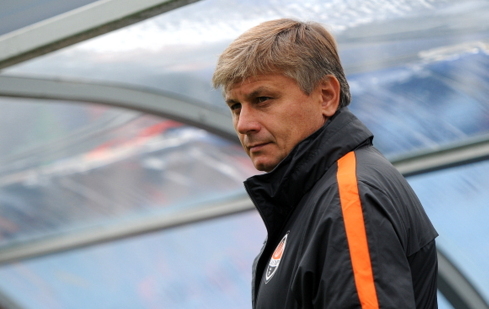 Shakhtar responded with a dangerous shot by Oleksii Kashchuk from a corner, but the striker's attempt went over the crossbar. Dynamo doubled the lead on 27 minutes: Ledniov made a brace after a flank cross from Yevhen Smirnov. The third goal was scored from a corner: Artem Pospelov deflected the opponent's shot, but Denys Popov was first to follow up. After the half-time, Shakhtar added to their game and quickly cancelled out one goal. Andrii Kuzmenko, fielded as a substitute in the second half, took advantage of the pass by Andrii Kulakov, passed the opponents' captain, and without closing in on the goalkeeper hit the ball into the far corner of Dynamo's goal. The home team subsequently managed to slow down the pace and neutralize the onslaught of the Orange-and-Blacks. In the 70th minute, Dynamo's counter resulted in a shot by Serhii Buletsa that hit the crossbar. In a couple of minutes the Pitmen had a chance to distinguish themselves, but the goalkeeper parried Kuzmenko's close shot. At the end of the game Shakhtar had a series of dangerous attacks, but the attempts by Kashchuk and Kuzmenko lacked accuracy. – It is hard to explain our failure in the first half. Our players lost in the most important elements - tackling, fervour, and desire. No one is immune from mistakes on the field, but we cannot afford to act as we did in the first half: losing in tackles, being afraid to make a mistake in passing. The opponents felt it and got the most out of it. During the half-time we tried to calm the guys, and told them that we needed to fight till the end and show character, that if they put on a Shakhtar jersey, they must fight, without conceding a single tackle. In the second half the team showed a more organized football. We equalised one goal and created more scoring chances, but, unfortunately, we had not managed to score more. Any defeat is a reason to draw conclusions and move on. I hope that we will see a completely different game in the next match.